There is simply no humane way to produce angora. Rabbits on angora farms are kept in tiny, barren cages for their entire lives. Their fur is painfully torn from their skin or they are tied to boards and roughly sheared every few months, which is a terrifying experience for these timid animals. Almost every store on the high street, from H&M to French Connection, has committed to keeping angora out of future collections after the cruelty of angora production came to light. But global brand Benetton has so far failed to commit to banning this unethical product and won’t give customers a straight answer about its angora policy. Please ask Benetton to get behind compassionate fashion by permanently banning angora now! via Tell the UK- Stop Importing Dog Fur Products – The Petition Site. Counterfeit products from China are being imported into the UK depite the laws which in which there is a total ban on the trade of cat and dog fur used by China for clothing, footwear and fashion. 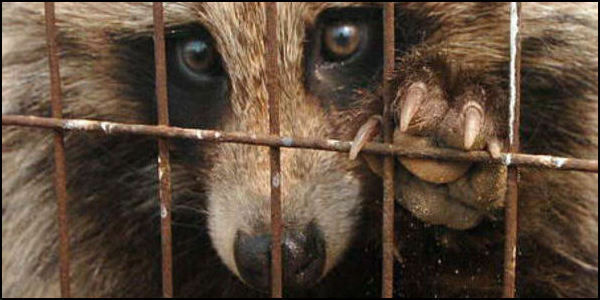 China continues to use dog fur and intentionally mislables the product as “racoon” fur. The racoon dog, is in fact part of the dog family- not the racoon family. They are farmed in China to feed the fur industry and suffer cruel and barbaric conditions- with their lives often ending as they beaten and skinned alive. Ask Harvey Nichols to Stop Selling Real Fur | Take Action | PETA.org.uk – 1. After being fur-free for nine years, department store Harvey Nichols has overturned its compassionate policy by selling items trimmed with real fur this season. We need to let the company know that this is the wrong decision – for animals and for its customers. Read more and contact the CEO of Harvey Nichols here.